India's coal bubble is perilously close to bursting. This week the Indian court system handed down three landmark energy rulings. While an ultimate decision still looms, the combined weight of these initial rulings reaffirms one thing -- it's time to diversify away from coal. Of the three rulings, the most talked about came in response to public outrage over sweetheart deals for private mining companies that provided access to coal mine leases for next to nothing. The discovery of these backroom deals -- now referred to as the "coal gate" scandal -- has rocked the Indian government, and the coal sector, for well over two years. The court's ruling found that 218 of these leases were illegal, in a sweeping verdict that affects all mine leases issued from 1993 through 2010. The court is set to decide whether the companies awarded these mines will be fined or whether they will lose the mines entirely on Sept. 1. Regardless, the signal the court has sent both the coal industry and the Indian government is that it is time to start over and only allocate energy resources -- like coal and coal mines -- in a transparent and fair manner. No matter how you slice it, that means increased costs. The fallout was immediate. Most notable was the financial community's reaction to concerns over billions of dollars that could be lost in bad loans issued to stranded assets. Indeed, with 8 percent of non-food lending exposed across the banking sector and billions invested in 37-gigawatts of new coal-fired power plants in Odisha alone, the fallout could be all too real. The irony here runs thick. The "coal gate" scandal that birthed this verdict began under the previous Prime Minister, Manmohan Singh, and was really the epitome of all corruption scandals -- though there were quite a few. In fact, "coal gate" has been a major issue facing the current Prime Minister, Narendra Modi. Despite bending over backwards to fast track coal projects, Modi's administration now faces serious setbacks to advancing coal power. Thats because while the courts ruling doesn't end coal expansion, it does potentially push the reset button -- a death knell for dozens of coal projects hanging by a financial thread. In addition, that reset will force coal miners to competitively bid for new mines which will only raise fuel prices for an already financially struggling sector. As bad as this news for the coal industry was, it's the second ruling from the Supreme Court that has delivered the one-two punch that may hurt the coal industry most. While most of the country was focused on the final stages of the engrossing coal gate scandal, the court handed down a new verdict in response to pleas for a bailout from the Tata Mundra Ultra Mega Power Plant (UMPP)and other coal-fired power plants struggling with rising coal import prices. Initially, Tata low balled its construction bid in order to win the project by underestimating the price of volatile and uncertain foreign imports. But this strategy backfired as coal prices rose so high that they now threaten to make the Tata Mundra coal plant, in the words of the Tata Mundra CEO, "financially unviable." But rather than allow these companies to pass on the skyrocketing costs and raise rates for average citizens, the Supreme Court reversed earlier rulings deeming any retroactive changes to tariff structures a no-go. That's incredibly important because if private developers are able to bid artificially low prices to win contracts and then retroactively change those contracts, the system as a whole is undermined. The signal this ruling sends is tremendously important because it goes right to the heart of contract sanctity in India. More importantly, the issue of equity and fairness was at play. It's hard to believe that billion dollar companies like Tata would have passed on fuel savings if coal prices magically dropped. Instead these energy giants were seeking to operate in a "heads I win, tails I win" situation. Thus far the Indian Supreme Court isn't having any of it. The fallout of this decision may ultimately be as sweeping as that of "coal gate." It will directly affect the country's flagship UMPPs program, a series of 4-gigawatt plants meant to stem the power crisis. Despite government and industry promises that these UMPPs will not succumb to the same dire fate as Tata Mundra and won't be affected by the court's revocation of mine leases, their future remains highly uncertain. For instance, two UMPPs are currently caught up in delays over concerns related to bidding processes and the ability to pass on fuel prices in the wake of Tata Mundra. As they wait to sort out the details, delays and local opposition continue piling on costs. 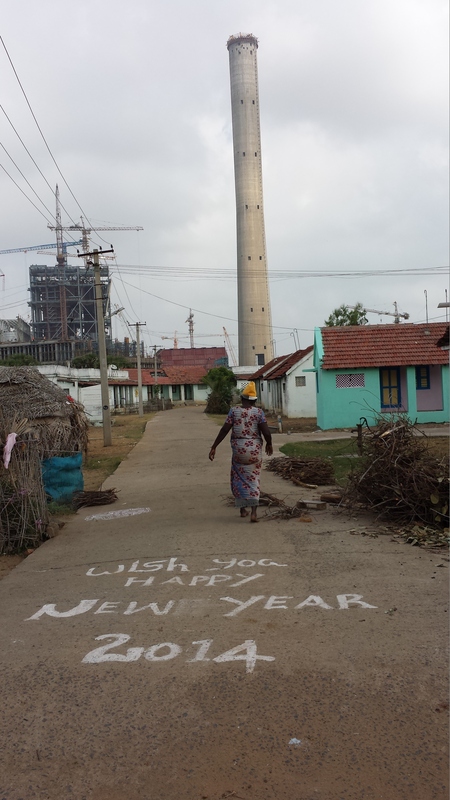 Meanwhile, another coal project seeking finance from the U.S. Export-Import Bank, the Tilaiya coal project, is mired in controversy and opposition from locals with over 100 Indian organizations opposing the Bank's potential support. In short, despite what the industry would have you believe, all is not well with coal in India. So with this brick wall settling across the road to coal expansion, what is a power-starved nation to do? Diversify to the fastest, cheapest, and most readily available energy resource at hand -- solar. As has been widely reported, all indications are that Prime Minister Modi takes solar power very seriously -- including a pledge to provide solar power for all by 2019. Rumors are that Modi is planning an incredibly ambitious solar target that could dwarf the already impressive 20-gigawatts of power the country has planned. That's a reflection of the rapidly changing economics of solar in India which are on course to be cost competitive with coal as early as 2018, according to HSBC. This is a feat wind power has already achieved which is leading the nation to dramatically increase support for new wind power to the tune of 10,000-megawatts every year. As it happens, just as the Supreme Court closed one door, another has remained wide open thanks to the Indian legal system. Solar companies were facing uncertainty over proposals to retroactively remove subsidies in Gujarat - which just so happens to be the state where the most solar has been installed to date. Here the Indian court system again upheld contract sanctity by refusing the government the ability to retroactively change contracts and subsidies for existing solar projects. So, there you have it. Investors can certainly continue to plow billions of dollars into a sector facing a highly uncertain and increasingly costly future. Indeed many of these fossil fuel investors will be sure to keep their heads firmly grounded in the sand as their bank accounts empty, thanks to their belief in the inevitability of coal. But for those who can see the writing on the wall, the future looks much brighter. Indeed, when it comes to future power sector investments in India, one thing is clear: all signs point to solar.